All Hallows Eve is just around the corner. Some people apparently used to believe that horrible monsters walked among us on that night. I’m not sure exactly how that morphed into children dressing up and going door-to-door begging for treats but as a kid I knew better than to ask too many questions. Why risk all that free candy? Check what my sister and I are wearing in this old picture. 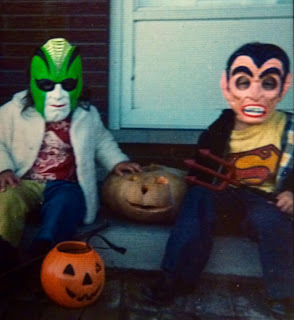 It’s a photo from the first year we got to put together our own Halloween costumes. It appears that we understood that the idea is to “dress up” but we hadn’t quite yet gotten that it’s supposed to be “as” something specific. Still, this isn’t the worst Halloween costume I ever wore. 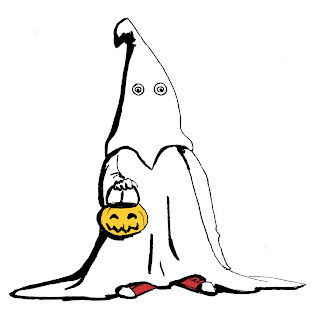 I must have been about six or seven years old and I decided that I was going trick-or-treating as a ghost. My mom thought that sounded great. Easy to make. Cheap. Perfect. “Here,” she said. “Take this sheet and cut a couple of eye holes in it." Done. But I wasn’t done. It didn’t look right to me. It looked like a blob. I thought my ghost should have a distinct head so I cut out a neck hole, draped the sheet over my body then made a “ghost mask” out of a matching white pillowcase. To my six-or-seven-year-old mind I looked exactly like a scary ghost. 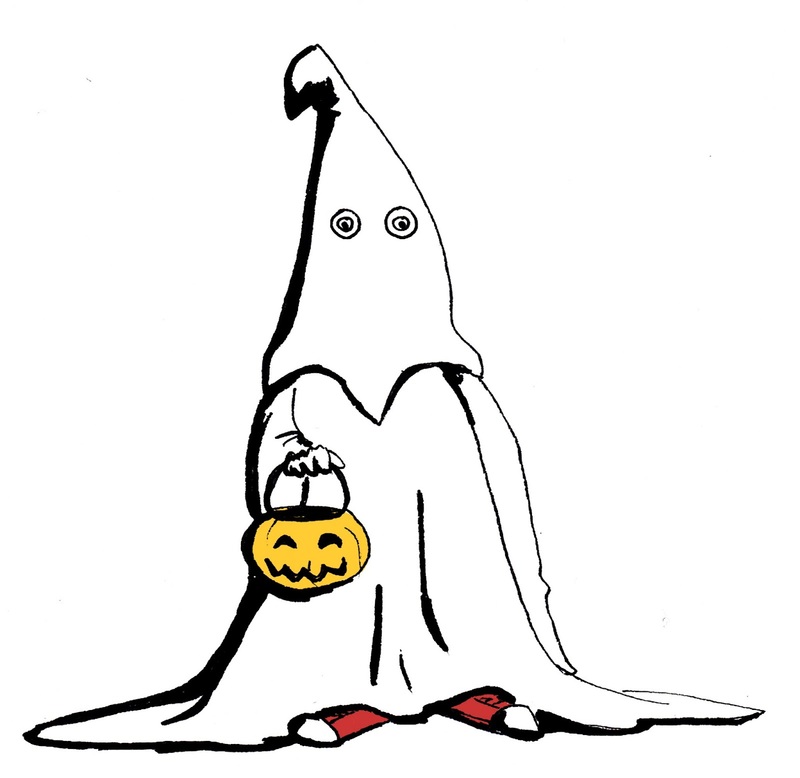 To any adult, though, I looked like a junior member of the Ku Klux Klan. There are no pictures but here’s an extremely accurate artist’s rendering. My parents tried to convince me to wear something else. Anything else. I wouldn’t budge so they let me go out like that. I distinctly remember the odd looks on the adult’s faces as they answered the doorbell to find me staring up at them through my hood’s eye holes. I kept having to answer, “I’m a ghost!” over and over all night long. I thought these people were idiots. What else could I be? One could argue that my parents should have put their foot down and not let their kid go out the door dressed like a tiny white supremacist but I beg to differ. I think they made the absolute right choice. To get me to change they would have had to explain in detail exactly what was wrong with my costume. By not doing that they gave me one more Halloween where all the monsters in the world were imaginary. That’s a gift even better than free candy.